In the first months of 1953, with his office mates scrambling to determine the molecular structure of DNA before his own father could beat them to it, Peter Pauling was mostly concerned with the English weather. He had been at Cambridge University since the fall of 1952 when he began his PhD program in physics at the university’s Cavendish Laboratory, and in that time he judged that he had seen a mere two full days of sun and was now officially fed up. His father, by contrast, was mostly concerned with finishing his most recent edition of The Nature of the Chemical Bond, for which he had often solicited Peter as a source to provide example problems and solutions prior to his departure for England. As he was now beginning his graduate research, however, Peter was too busy to provide much assistance for this edition. Instead, he was mostly occupying himself with a muscle camera developed by Hugh E. Huxley, a molecular biologist studying the physiology of muscle with Max Perutz’ Medical Research Council (MRC) Unit of Molecular Biology at Cambridge. Taking pictures of fibrous and globular proteins – beginning with insulin and tropomyosin – Peter applied the Cochran-Crick theory, with the goal of determining the helical structure of these protein molecules. 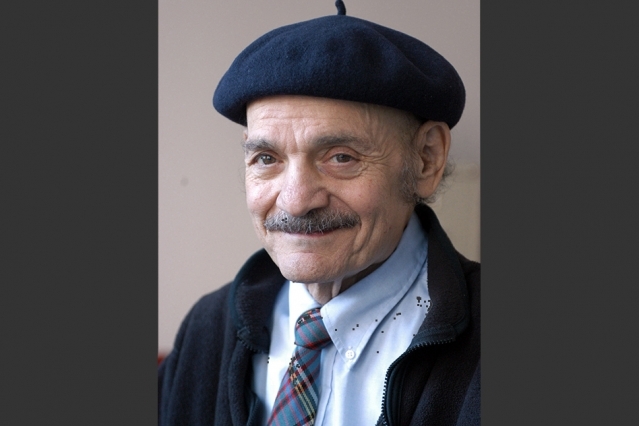 This inquiry was, in principle, made possible by Linus Pauling’s work from less than a decade prior. 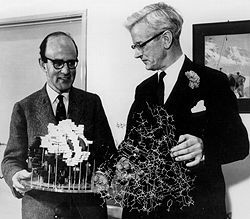 Since 1947, when the MRC unit was founded by Sir Lawrence Bragg, John Kendrew and Max Perutz had endeavored to use x-ray crystallography to determine the molecular structure of hemoglobin in sheep. By the time that Peter arrived at Cambridge, however, hemoglobin had proven to be an untenable object of study, and Kendrew’s focus had shifted to myoglobin. Whereas hemoglobin is found mostly in the blood, myoglobin is generally found only in muscle tissue. Both are proteins that carry oxygen to cells. Problematically, myoglobin is one fourth the size of hemoglobin, and too small for the era’s techniques of x-ray analysis. To solve this issue, sperm whale myoglobin was used in hopes that the molecular details of the larger, oxygen-rich proteins of a diving mammal would be more observable with the tools then available. “Stranded whales are the property of the Queen,” Peter explained to his father as he discussed this work, “but we have an agreement with her to get a piece of meat if one comes ashore.” Nonetheless, though availed of samples from beached whales in the United Kingdom and from countries as far afield as Peru, Kendrew could not render the x-ray diffraction patterns with complete certainty. Sperm whale myoglobin image created by John Kendrew. In 1953, Perutz realized that by comparing the diffraction patterns of natural whale myoglobin crystals to crystals soaked in heavy metal solutions – a procedure called multiple isomorphous replacement – the positions of the atoms in myoglobin could be more accurately determined. Accordingly, Peter was tasked with making countless measurements in support of this effort. Peter wrote to his father often over the next two years as he struggled to complete this project, which was the focus of his PhD. In particular, Peter asked for advice on how one might best get heavy metal atoms onto myoglobin, detailing his attempts to use everything from saltwater to telluric acid, which was used to produce salts rich in metallic contents, such as the element Tellurium. Indeed, Peter’s work proceeded slowly, not least of all because of his knack for keeping things entertaining. Shortly after Watson and Crick’s discovery of DNA, for example, he fabricated a letter of invitation from his father, Linus Pauling, to Francis Crick, requesting Crick’s presence at an upcoming conference on proteins at Caltech. 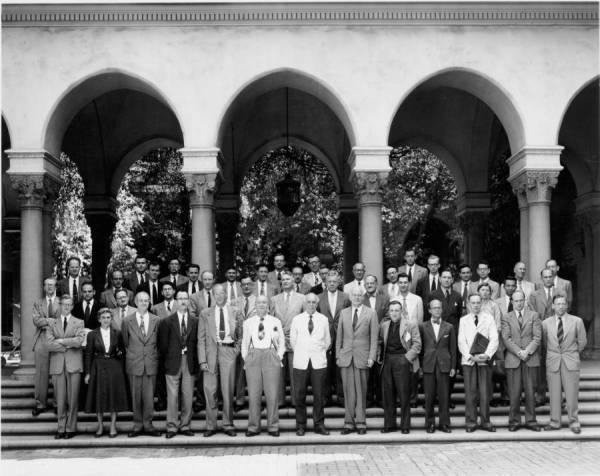 “Professor Corey and I want you to speak as much as possible during the meeting,” the impostor Pauling said to Crick in the fake letter, even urging him to consider lecturing at Caltech as a visiting professor. 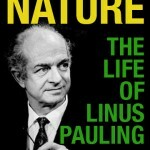 Linus Pauling had appeared to sign the letter himself, his signature skillfully forged. The letter proved so convincing that Crick actually replied, accepting the invitation to speak at the conference. Before long, it became apparent that the entire communication was, in fact, a practical joke. Lawrence Bragg, the director of the Cavendish Laboratory, where Crick himself worked, was scheduled to speak at the proteins conference in the same time slot that the fake letter had proposed for Crick. Were it not for this, the deception might have gone even farther, since upon seeing his son’s forgery Linus himself was almost convinced that he had written the letter and had simply forgotten about it amidst the relentless pace of his schedule. Ever a stickler for the details, however, Pauling noticed a grammatical error in the document that he would never have made. From there, he deduced the letter as having been authored by his mischievous son. For this transgression, Linus subtracted a five-pound fine from the $125.00 check that he sent to Peter each month. Max Perutz, 1987. Image Credit: Graham Wood. In 1939 Max Perutz’s girlfriend gave him a book token for Christmas. 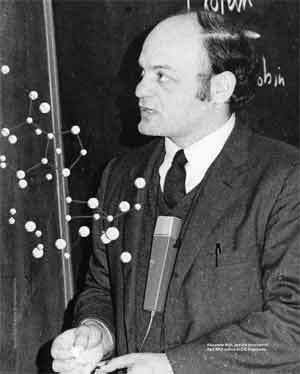 Working on finishing his dissertation on the structure of hemoglobin, Perutz used that token to purchase Linus Pauling’s recently published text, The Nature of the Chemical Bond. In the obituary of Pauling that he wrote some fifty-five years later, Perutz described how the “book transformed the chemical flatland of my earlier textbooks into a world of three-dimensional structures” and “fortified my belief, already inspired by J. D. Bernal, that knowledge of three-dimensional structure is all-important and that the functions of living cells will never be understood without knowing the structures of the large molecules composing them.” The purchase of Pauling’s book marked the beginning of a long, fruitful and sometimes contentious correspondence between the two men, working on separate continents but united by similar interests. As such, Perutz hoped that someone in Pauling’s lab might do the calculations for him. Pauling was not moved enough by Perutz’s request to offer the labor of his own team, replying that enlisting someone do such work in a “routine way” could lead to confusion. Pauling did offer that Perutz come to Pasadena, or send a surrogate to do the work, if he could find the money. Perutz was unable to support such an undertaking and so ended that conversation. Linus Pauling and Lord Alexander R. Todd. Cambridge, England. 1948.
he would reel off the top of his head atomic radii, interatomic distances and bond energies with the gusto of an organist playing a Bach fugue; afterwards he would look around for applause, as I had seen Bertrand Russell do after quoting one of his eloquent metaphors. The two also found time to talk together about their own particular research projects. Pauling’s work at Oxford touched directly on Perutz’s own program, in what would become a oft-noted story in twentieth century history of science. 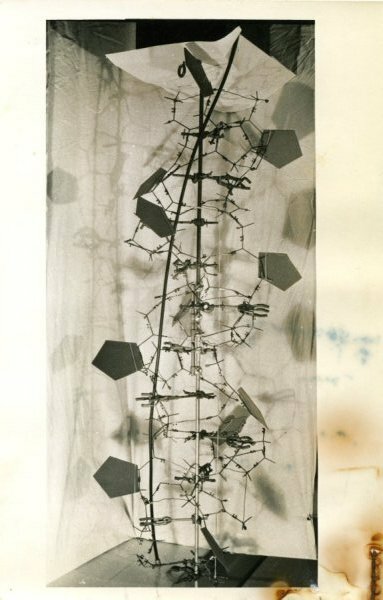 As Pauling lay in bed with a cold, he did not stop working, choosing to spend his time making planar peptide models with paper chains. 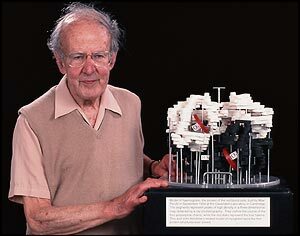 From his paper folding exercises, Pauling, according to Perutz’s obituary, “found a satisfactory structure by folding them into a helix with 3.6 residues per turn.” (A story that Pauling relayed many times himself.) The structure would come to be known as the alpha helix. 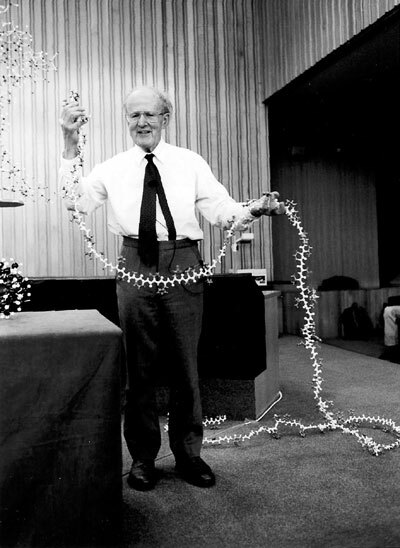 After Pauling recovered from his illness, Perutz showed him his own model of a polypeptide chain which was part of his larger hemoglobin model and was similar to fibers described by William Astbury. To Perutz’s “disappointment, Pauling made no comment,” and gave no hint as to his own breakthrough, which he announced the next year in a “dramatic lecture.” That later unveiling of the alpha helix gave rise to a famous Perutz anecdote, which later informed the title of a book of essays that Perutz published. So I cycled home for lunch and was so preoccupied with the turmoil in my mind that I didn’t respond to anything. Then I had an idea, so I cycled back to the lab. I realized that I had a horse hair in a drawer. I set it up on the X-ray camera and gave it a two hour exposure, then took the film to the dark room with my heart in my mouth, wondering what it showed, and when I developed it, there was the 1.5 angstrom reflection which I had predicted and which excluded all structures other than the alpha-helix. Once Pauling returned to Pasadena, he and Perutz fell into a minor quarrel. In December 1950, Perutz had heard that Pauling had been “annoyed” by Perutz and John Murdoch Mitchison’s paper, “State of Hæmoglobin in Sickle-Cell Anæmia,” which had been published in Nature that October. Pauling was upset that Perutz and Mitchison had suggested that crystallization caused cells to sickle without properly citing his own seminal work on the subject. There is perhaps a slight difference between our points of view. Whereas you regard the sickling as being due to an aggregation and partial alignment of hæmoglobin molecules by a lock and key mechanism, an interlocking of specific groups in neighbouring molecules, we regard the cause of the sickling as being simply a crystallization, due to abnormally low solubility of the reduced hæmoglobin. No specific interaction of the kind you mention need be involved in the second process, though it obviously may be…I am sorry that this misunderstanding between us should have arisen, particularly as I have spent much effort trying to convert unbelievers to your scheme. 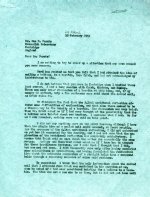 Pauling waited until the following February to respond and explained his feeling that readers of Perutz’s article might conclude that Perutz was making an original proposal. Having made this statement, Pauling, in his own way, moved beyond the quarrel by telling Perutz about his more recent work showing that “hemoglobin is not crystallized in the sickle cells, but is only converted to the nematic [or liquid crystal] state.” The ice broken, Perutz quickly responded by inviting Pauling to take part in informal discussions about protein structure at the Cavendish Laboratory before an annual conference, to be held in Stockholm. Pauling, however, could not attend. The next year, Pauling attempted to visit England, this time to speak at a conference about the alpha helix, but was delayed due to his passport renewal being denied on account of his political activities. Perutz wrote that Pauling’s “absence had a sadly damping effect on our meeting at the Royal Society, and it made the discussion rather one sided as there was no none to answer the various objections to the α-helix raised by the Astburites and Courtlauld people” since Pauling’s supporters were unprepared to defend Pauling’s position without him. Perutz was also keen to show Pauling his own progress, an eagerness that Pauling reciprocated. By July Pauling had cleared up his passport problems and was able to spend time in person discussing his and Perutz’s work. There was only brief discussion of α keratin at this time, and, if my memory is correct, only a few sentences were said about the coiled coil, as Crick calls it. We discussed the fact that the 5.15-Å meridional reflection offers some difficulties of explanations, and that also there seemed to be a discrepancy in the density of α keratin. The discussion was very brief. Then Mr. Crick asked me if I had ever thought of the possibility that the α helixes were twisted about one another. I answered that I had. So far as I can remember, nothing more was said on this point. Pauling went on to emphasize that “the idea was not a new one to me then” and that his own description of it in Nature was different from Crick’s understanding. Perutz ceded this point, adding that Pauling’s differences with Crick “stimulated Crick to clarify his own” ideas on the coiling of alpha helixes. 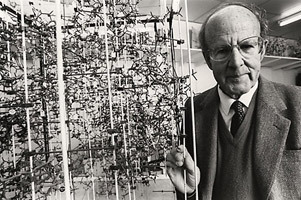 More generally, Perutz found that the competition that arose between the two labs as they worked on similar problems helped to push each forward, thus leading to positive advances. Correspondence between Perutz and Pauling dipped a bit after the conference, though Pauling did take a moment to congratulate Perutz on being elected to the Royal Society the following Spring. While the exchange was brief, it reflected the long relationship built up between the two over the preceding years and, in particular, a confluence of work that had boosted the esteem of both scientists. Perutz had begun looking at the structure of wool proteins back in 1951, thinking that there might be similarities to hemoglobin. He became excited after finding Pauling’s work on alpha helixes in fibers, thinking that the structure might be present in wool as well. His initial studies resulted in disappointment, but after adjusting the angle at which he was taking his x-rays by 30 degrees, he compiled new data that confirmed Pauling’s alpha helix structure. After applying it to his own work on hemoglobin, Perutz told Pauling “the discovery of this reflexion in haemoglobin has been the most thrilling discovery of my life…there is no doubt that it is a universal feature at least of all fibers of the α type. Whether all crystalline proteins show it remains to be seen.” Not suprisingly, Pauling was also “very pleased” with this discovery. This research opened the door for Perutz to be considered by the Royal Society. But it was his development of a technique for determining a three-dimensional view of structures derived from x-ray crystallography that assured his election. He did this be attaching mercury atoms to hemoglobin, which allowed him to figure out where the crest and trough of a given x-ray was in relation to the structure that appeared on the photos. Perutz later said that after he finished the work and published it in Nature at the end of 1959, he went skiing in the Alps, and by the time he returned he was famous, assuring his fellowship in the Royal Society. Coiled-coil illustration from Pauling and Corey’s Nature publication of January 10, 1953. Within the overarching saga of the race for DNA between Linus Pauling’s Caltech lab and Sir William Lawrence Bragg‘s Cambridge lab, the Cavendish, there existed a small yet interesting story of controversy and intrigue: the case of the coiled-coils. In August 1952, Linus Pauling visited England during the final leg of a larger European tour largely devoted to touting his important new discovery, the alpha helix. Lecturing about his proposed protein structure inevitably led to Pauling’s visiting all of the major centers for research in England that were focusing on proteins. One of these centers was the Department of Physics at Cambridge University – the Cavendish – directed by Bragg, a Nobel laureate and Pauling’s long-time scientific rival. While visiting the Cavendish, Pauling also met with a non-traditional graduate student with whom he had communicated only a few times, via letter. 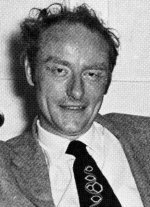 This student was Francis Crick, the British scientist who, together with his American colleague James Watson, would go on discover the double-helical structure of DNA the following year. 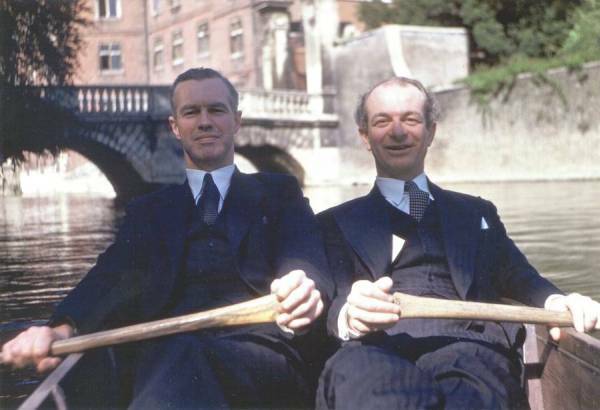 One afternoon during Pauling’s visit, Crick and Pauling shared a taxi cab as they traveled around the premises of Cambridge. 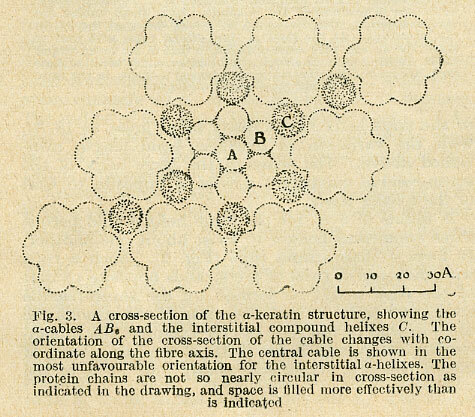 During this jaunt, the two discussed several topics of mutual interest, including Pauling’s alpha helix. Eventually this conversation turned to an examination as to why Pauling’s model of the alpha helix lacked the 5.1 angstrom repeating turn (all helices, by definition, twist) found in x-rays of keratin, a fibrous protein structure that makes up the outer layer of human skin. Pauling’s model predicted a turn every 5.4 angstroms. This mystery had remained a thorn in Pauling’s model since his publication of the alpha helix a year prior. During their cab ride, Crick is reputed to have asked Pauling about the possibility that alpha helices are coiled around one another. Pauling, according to a letter recounting the event, replied that he had, and that this reply marked the end of the discussion of coiled-coils between the two scientists. Crick, however, claimed in a later letter that the conversation was longer and more detailed. Whether or not the conversation was brief or of greater length, this was the beginning of a controversy. His tour completed, Pauling returned to Caltech and renewed work on the angstrom reflection problem dogging the alpha helix. He and Robert Corey, the biochemist with whom Pauling and Herman Branson had collaborated to develop the alpha helix, soon found that if two to seven alpha helices were wound “like a piece of yarn around a finger, into a sort of coiled-coil” the resulting structure would match the 5.1 angstrom reflection found in x-rays of keratin. 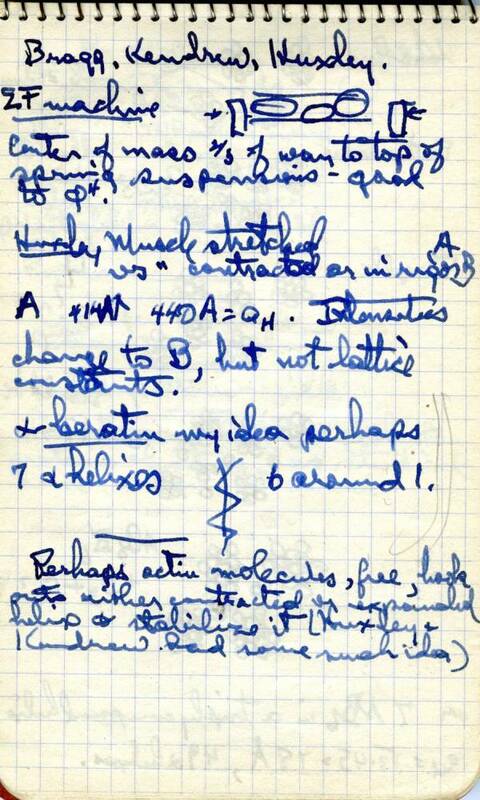 This addition to the alpha helix hypothesis built upon an undated idea of Pauling’s that was written down in a travel journal that he kept during the European tour. The notes describe a structure that Pauling named “AB6” – six alpha helices (B6) coiled around a seventh (A). Meanwhile, back at Cambridge, Peter Pauling – one of Linus and Ava Helen’s three sons – was working at the Cavendish as a graduate student alongside Crick and Watson, having arrived the same summer as his father. 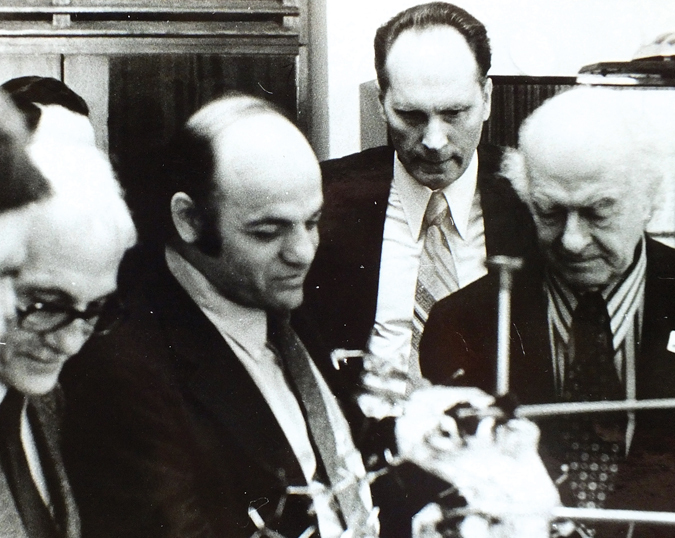 Peter told Crick – who was also working on “coiled-coils” of the alpha helix – of his father’s research in Pasadena. This news undoubtedly felt to Crick like Linus Pauling had built upon the ideas that Crick brought up in their conversation. In a rush to be published first, Crick hurriedly finished his research and dashed off a note to the journal Nature in October 1952, only to discover that Pauling’s own manuscript had arrived just a few days before. However, in a surprise twist, Crick’s manuscript was published first, likely due to two factors: 1. Crick’s paper was shorter, and 2. it was sent with a cover letter from Max Perutz, a supporter of Crick and part of Bragg’s Cavendish team, requesting high-speed publication. The following month, Pauling wrote a letter to Jerry Donohue, a former Caltech doctoral student who had worked with Pauling since the 1940s and was, at the time, working at the Cavendish on a Guggenheim Fellowship. The communication was in reply to a letter that Donohue had written to Pauling reporting on Crick’s Nature submission. In his reply Pauling explained that he remembered the conversation with Crick involving the alpha helix during the past summer. 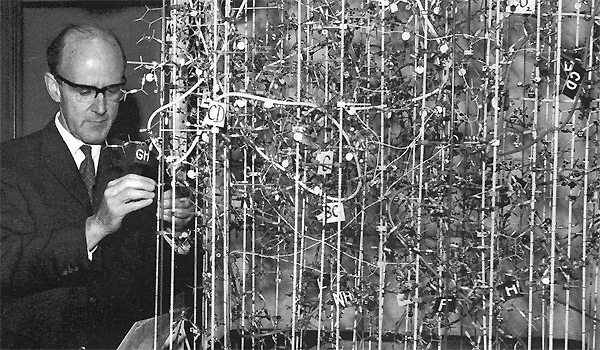 Cognizant of the controversy brewing over the provenance of the coiled-coil idea, Pauling specifically wrote that the conversation with Crick was brief. 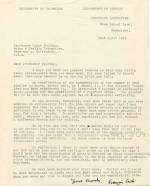 A few months later, in March 1953, Pauling wrote a similar letter to Max Perutz, this one containing more detail on the matter. Pauling mentions in the letter that he had thought of Crick’s suggestion prior to their conversation, but had not fully fleshed it out; a claim perhaps supported by Pauling’s travel journal. Pauling to Perutz, March 29, 1953. Francis Crick was given a copy of Pauling’s letter to Perutz. In response, Crick recalled the taxi cab conversation as having been longer than Pauling remembered, and more in depth on the subject of the coiled-coils, thus leading him to the assumption that Pauling had built upon his ideas. This would have been fine, Crick wrote, had Pauling simply informed Crick so that the two scientists could publish simultaneously, giving credit where credit was due as well as bolstering each other’s work. Crick to Pauling, April 14, 1953. Crick did admit that Pauling’s paper was more detailed and thorough than was his own, and also came to different conclusions on key points. These factors were enough for both Caltech and the Cavendish to declare that Pauling and Crick had generated their ideas on coiled-coils independent of one other, if simultaneously.